On this day in 1979, Asa Earl Carter, part Indian, segregationist, politician, speechwriter, and novelist, died as a result of a fistfight with his son in Abilene. Carter was born in Anniston, Alabama, in 1925. By the late 1950s he was in Birmingham, Alabama, where he hosted a radio show for the American States Rights Association and was a leader of the Alabama Council movement. Later he founded the North Alabama White Citizens Council. He created a KKK group of his own: the Original Ku Klux Klan of the Confederacy, a very scary paramilitary organization. Its members participated in the stoning of a black female who tried to register at the University of Alabama. They beat up a local civil rights worker and stabbed his wife. They physically attacked singer Nat King Cole on stage at a Birmingham concert. Read more here. He was one of two writers said to be responsible for the words “segregation today, segregation tomorrow, segregation forever” uttered by Governor George Wallace. After an unsuccessful run against Wallace in the Democratic gubernatorial primary in 1970, Carter gave up politics and left Alabama. 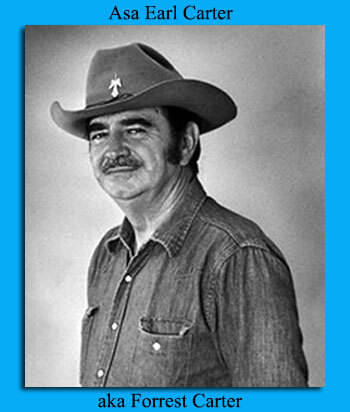 He adopted the pseudonym Bedford Forrest Carter and settled in Sweetwater, Texas, where he used the resources of the City-County Library to work on his first novel, Gone to Texas (1973). The highly successful film version starring Clint Eastwood is entitled The Outlaw Josey Wales (1976). Carter wrote three other books, including the purported autobiography The Education of Little Tree (1976), before his untimely death.